Yo La Tengo's first album Ride The Tiger, though he had played and recorded before that with other folks like The Human Switchboard (where he first teamed up with drummer Ron Metz), Jon Klages (of The Individuals), and the like. After Ride The Tiger, Dave left to form his own band with the aforementioned Ron Metz, and they played their first gig billed as The Schramms kind of as a joke. The name stuck. The original band had Metz on drums, a founding member of critic's darlings The Human Switchboard, and bassist Terry Karydes, who had played with a mysterious combo called Georgia and Those Guys. Then some creep popped the trunk on a friend's car and stole Terry's Danelectro, so she switched to playing organ. Mike Lewis, formerly of Yo La Tengo, took over on bass. Add guitarist Todd Novak and Vice Royal Pete Linzell on sax and you have the band that started to record their first album, Walk To Delphi, in 1989. Mike soon left to make designer cold medications, and Todd and Pete departed to ride the wild surf. Al Greller, who had been spotted playing in The Tall Lonesome Pines, joined to play bass. This is the lineup that finished Walk to Delphi. OKra/Rough Trade released it in early 1990 to great reviews. Within weeks however, Rough Trade US went out of business. There is no proven connection between these two events. The band recorded their second album called Rock, Paper, Scissors, Dynamite, released in 1992, at first only available in Europe on NORMAL Records. It was finally re-released in the US by ESD in 1995. The quartet toured Europe in the summer of 1992. Terry left in 1993 to design books, and George Usher stepped in, bringing with him a certain swagger and an ear for a fine pop melody. Three years later he stepped out again to devote all his time and energy to his own band. While he was around, the band made two records. In 1994 they came out with Little Apocalypse, once again for NORMAL Records. Then in 1996 Dizzy Spell was released, this time with the new label Blue Rose Records. When George left after Dizzy Spell the band welcomed two new members. Andy Burton on keyboards and Jon Graboff on guitar. Jon was not new to the band. He had done a lot of live shows with them after the first record. 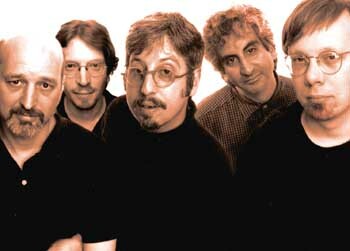 Then played mandolin on their second album Rock, Paper, Scissors, Dynamite and, in his other life as a photographer, took the first published photos of the group. In the autumn of 1998 Dave recorded his second solo acoustic album, called Hammer and Nails. He and Jeb Loy Nichols toured Europe when it was released in early 1999. 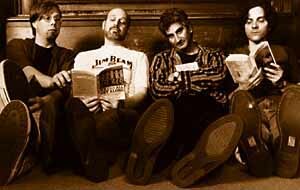 Then it was time for the band to record a new album, their fifth, released in the spring of 2000 on Blue Rose Records. The album is called 100 Questions and was produced by J.D. Foster. J.D. 's most recent work includes the last two albums by Richard Buckner and Marc Ribot. On 100 Questions the band was joined by some other friends as well - Richard Buckner, Jeb Loy Nichols and Syd Straw. Each of the members of The Schramms has made music for other folks as well. Dave has recorded with Peter Holsapple and Chris Stamey (Mavericks, It's Alright, Fireworks), Kate Jacobs (all), Myra Holder (Four Mile Road), The Replacements (All Shook Down), Yo La Tengo (Ride the Tiger as a member of the band, Fakebook), Freedy Johnston (Can You Fly, This Perfect World, Never Home), Soul Asylum (Let Your Dim Light Shine), Richard Buckner (Since), Whiskeytown, Will Rigby, Glenn Morrow, Wagon, Hank McCoy and the Dead Ringers and others. A founding member of The Human Switchboard, Ron played and recorded with the various solo efforts of his former bandmates, Bob Pfeifer's album After Words, and Myrna Marcarian's Human Touch. Ron was the drummer on the Dos Dragsters contribution to the Brian Wilson Tribute album, and appeared on the OKra All-Stars version of Purple Rain.He later played on the European tour with those OKra All-Stars. Al had been playing with Peter Stampfel and the Bottlecaps before he joined The Schramms, and is on their latest and greatest album, due out next year on Rounder. He also held down the fort for the Tall Lonesome Pines, Beat Rodeo, Paul Presti (of the Unholy Modal Rounders), The Tractors, Riff Doctors, and a singing plumber. Al played the bass on Yo La Tengo's Fakebook album. Jon has played with Freedy Johnston, Amy Rigby and Will Rigby, Beat Rodeo, Steve Almaas, and P.F. Sloan. Andy has played with Grace Pool, Tiny Lights, Freedy Johnston, Health and Happiness Show, and Colin Blunstone. Matador Records has some more blab at their website. Matador's newsletter Escandolo did an interview with Dave's mom a while back (no, really).